Adding a sticky top bar in Genesis is a good way to promote anything special whether it is discount or deal. 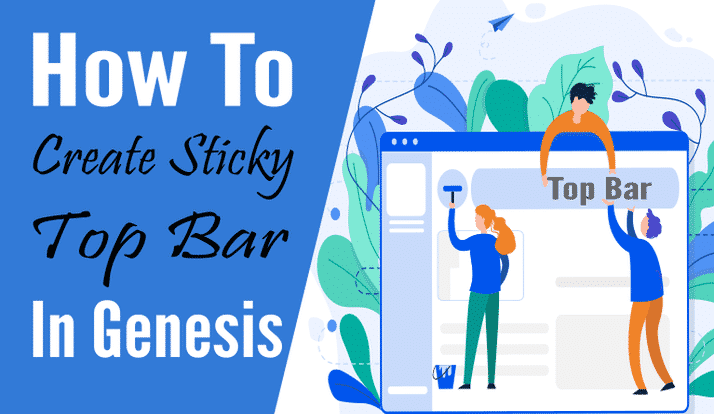 In this short tutorial, I will show you how to add or create sticky top bar in Genesis. There are few reasons for adding a top bar in your website. Few of them are. If you want to advertise any post/page. Important message to the website users. You can put any information in the top bar as you like. Remember you, I will not style it as much because everyone has own needs. So you can use HTML widget of WordPress and then style as per your need. Let’s start. This section has many parts like creating widget area, displaying it, adding jQuery, and styling. I will cover each of them in depth. I request you to follow the steps carefully. Let’s start with first part. This is the important part of the process. We will add a widget area named as ‘Top Bar’. Enter the code in the functions.php file but please be careful while editing file. Because if you did a wrong thing, your admin area will show you white screen. If you entered code correctly, you will see a new widget area like this. I want the top bar to be shown on every page like home, posts, pages. So I will add this code to display widget area before header using genesis hook. Add this code to the functions.php but carefully. Here I am genesis_before_header hook, you can display the widget area anywhere using the hooks. You will have to create a file named as top-bar.js anywhere but lib folder is recommended. So I put the file inside themes lib folder. Add the following code to the file we just created. Now we need to enqueue this script and we have to load it after jQuery. The reason for adding this script is to create sticky top bar in Genesis scrolling and stylish. Add this code to functions.php . The jQuery script we applied earlier adds a class to the widget area. With the help of added class, the top bar becomes sticky. I haven’t added much style to it because as said earlier everyone has own needs. You can style it as per needs. Add below code to the style.css to make the top bar good looking. Finally, the output of our work is. I hope you loved the tutorial, if so please do share and comment.